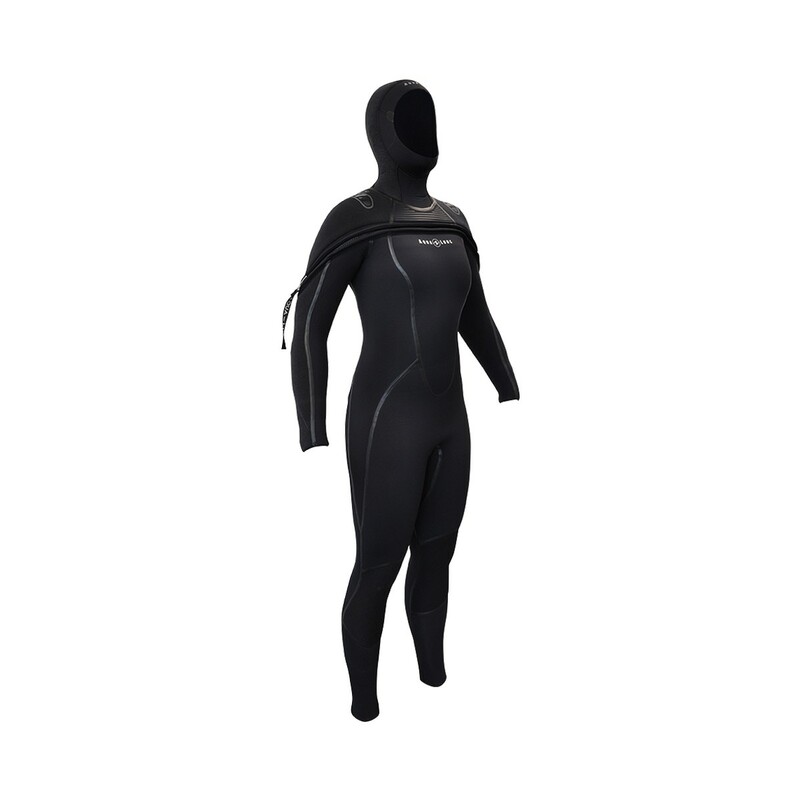 The SolAfx is Aqua Lung's most advanced wetsuit, with unique features like an integrated hood and internal arm and leg cuffs. The redesigned SolAfx suit now includes Aqua Lung's X-Tend cuffs, providing a finished look with maximum stretch. It has new environmentally-friendly features, such as the non-P.A.H. (Polycyclic Aromatic Hydrocarbons) neoprene. Unique designs are specially tailored for men and women. 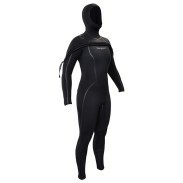 The suit provides maximum warmth, thanks to its 8mm torso and 7mm arms and legs. • X-tend cuff technology provides a finished look without sacrificing stretch by removing restrictive edge tape. • Environmental friendly features: neoprene free of P.A.H. (Polycyclic Aromatic Hydrocarbons), made from a non-petroleum based material, and has REACH (European Union standards) approved thread. 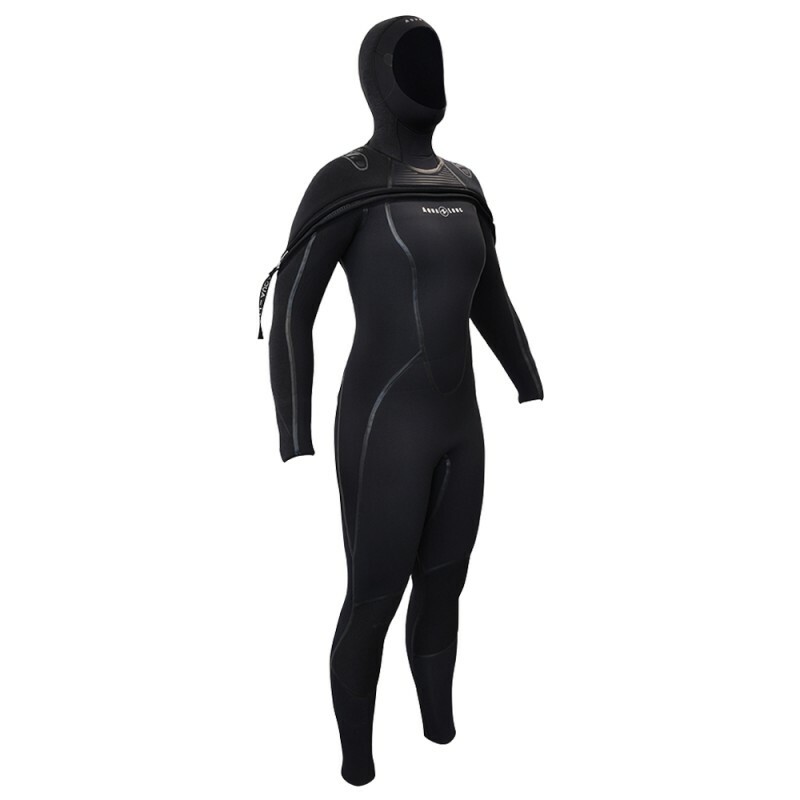 • 8mm AquaFlex neoprene used in the torso with 7mm AquaFlex neoprene on the legs and arms for added flexibility. • Liquid Fusion Seam Technology with reinforcing patches on the inside at seam junctions enhances the durability and integrity of the seams. • Silicone no slip shoulder feature provides added protection and helps to keep the BC shoulder straps in place. • A water dam covers the neck and shoulders, providing an additional layer of thermal protection against any water entering through the zipper. • "Skin-in" gasket seals in the forearms and calves minimize water entry through the sleeves and legs. • Lower back pad helps keep water out. • The outer nylon material is resistant to abrasions and "hook-and-loop" snags due to the tighter weave to keep your suit looking good! • The inner material is ultra soft making these suits easy to don and doff. • An improved Powertex kneepad offers increased flexibility while offering excellent abrasion resistance. • Pre-bent anatomic legs and arms provide a more comfortable fit and reduce bunching of material at the joints. • The attached hood offers G2 Vent Technology that allows trapped regulators exhaust bubbles to exit while keeping cold water out.